My eleven month old daughter and I keep getting into little spats. She loves her toothbrush and every time we've had her brush her teeth she refuses to give up the tooth brush after we're done with it and she cries horribly if I take it from her. Also, she keeps grabbing at things she wants that I don't want to let her have, like my diet chocolate bar or my glasses or my laptop; and when I keep or take it away from her she gets angry, starts crying, and she even bit me once. You summed up motherhood in a nutshell: Where and when to draw the line!? I agree you want to draw the line or your baby will grow up to think there is no such word as "No." A laptop is expensive and I think is worth the battle! A food item not so much. Besides, you want her to stay interested in what you eat so, at times, she can try it to get her and keep her interested in different kinds of foods. The real battles begin around age two! So think ahead! She'll be stronger and louder and more apt to not let go of what she wants. In infant and tot stage (0-24 months) it is easier to get their attention away from what they want (your laptop) and onto something else (an old remote control that is never used!). As for the Montessori approach, remember we are typically talking about a classroom environment. Most everything is accessible. 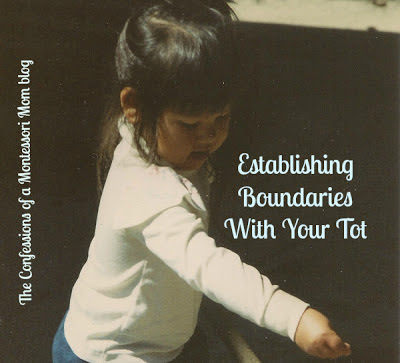 But still, there are boundaries (like the phone and the office and certain cabinets). What I try to get parents to understand is that, in a Montessori world, we focus A LOT on the environment, first. So start there. Take away trouble items, if you can, or keep them up high, but eventually, the battle will come. Just try not to have too many! When my son was small, we had to keep his glasses on him all the time, and we agreed that was one of our number one battles, things like toothbrushes I let go, because for me, wearing his glasses was more important. So, yes, have a few items out of reach and out of sight (like your laptop); and others be willing to let go of, like the toothbrush; and battle over chocolate bars (I would! We're talking chocolate!). And try to get into the habit of saying, "Mommy's turn!" or "No thank you!" Because eventually she will repeat it back to you and to other children! You have a strong willed child! This will be great in the long run! In the short run (until around age three) it will be a challenge, don't be afraid to say, "No" (or "Mommy's turn!") and it's OK to rearrange your home environment to have fewer battles, and to also let a few things go!